Spring is a subtle process in the dry grasslands of B.C. 's interior. A week of warmth may be followed by chill snow. Slowly aspen and willow leaves open into pale green haloes. Under the sage brush buttercups and fritillaries hide modestly among last year's grasses. Tentatively ducks, robins, meadow-larks, mountain blue birds return to the ponds and ponderosa pines. March and April are months of turbulent winds. One day, from the blustery air comes a clear, lilting musical call. The sand-hill cranes are flying north. Now, it's truly spring. George Archibald, co-founder of the International Crane Foundation, believes the sandhill's voice is the loveliest of all crane calls. As the great flocks soar overhead following the retreating winter northward, they constantly 'talk' among themselves. Their continual low, melodious chatter is audible even when, rarely, they fly at night. They're especially vocal when 'kettling up', circling to gain altitude, sometimes up to 200 feet at once, on rising thermals along cliff faces and over hills. "Every land where they appear", writes Peter Matthiessen, "has tales and myths about the cranes, which, since ancient times, have represented longevity and good fortune, harmony and fidelity…The cranes are the greatest of the flying birds and….the most stirring…because the horn notes of their voices, like clarion calls out of the farthest skies, summon our attention to our own swift passage on this precious earth. Perhaps more than another living creature, they evoke the retreating wilderness, the vanishing horizons of clean water, earth and air upon which their species and ours ultimately depend for survival." "The sandhill" Matthiessen continues, "commonly travels a mile above the earth and can soar higher, to at least 20 thousand feet….Tha t cranes may journey at such altitudes, disappearing from the sight of earthbound mortals, may account for their near-sacred place in the earliest legends of the world as messengers and harbingers of highest heaven.."
Scientists believe the species has survived, notes Nebraska wild-life photographer Michael Forsberg, because of its highly complex social behaviour, long term care for its young, innate wariness, and social adaptability. Sandhill cranes may live for 33 years. They have elaborate courtship rituals and most mate for life. Both parents incubate the nest and care for the young. But, there's much more to crane culture than fidelity and good parenting. Cranes use camouflage. At least, that's how scientists interpret the returning cranes daubing their feathers with wet, decaying marsh vegetation and mud on their flight north. North American sandhills 'paint' their already dun coloured feathers. But, other cranes do this too, to a lesser degree. 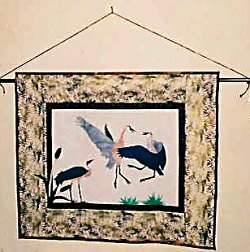 Perhaps, thinks Matthiessen, for them self-adornment may be "no more than a .. ritual, a vestigial trait of some ancestral crane." And sandhill cranes dance! Jumping, bowing, stick-tossing, arching their long necks, they cavort exuberantly. Dancing is often part of courtship and mating rituals but scientists speculate it may also foster socialization within the group or relieve tension. Myself, I think cranes dance for sheer joy. Sandhills, says wildlife biologist Rick Howie, are very traditional birds, returning in a ritualized fashion to their favourite stopping places, sometimes setting down within 50 metres of the same patch of ground where they landed on former migrations. No wonder these birds have so much to say to each other! The majority of North American sandhill cranes migrate from their wintering grounds in Texas and Mexico, up the central flyway, stopping on Nebraska's famed Platte River, before dispersing to nesting sites across the Canadian, Alaskan and Siberian Arctic. But, the cranes flying over the Thompson and Cariboo grasslands are a different group, the Pacific Flyway Population, numbering approximately 25,000. Long separated, perhaps by glaciers, from their prairie cousins, these cranes winter in the Central Valley of California and nest as far north as the Cook Inlet and Bristol Bay regions of Alaska. We still have much to learn about crane migration. No one knows the social connections which decide the size and membership of a group of traveling cranes, or even all the factors which trigger individual migration times. Nutrition, health, daylight, all play a part. In early March cranes become restless. From the second week of March through the end of April, in staggered departures, groups as small as 15 and as large as 100 leave their winter quarters along the Sacramento and San Joaquin rivers. At the Harney Valley in Oregon, the Pothole Reservoir and Banks Lake in Washington, the large birds halt for days to feed, gathering strength for the long trip ahead. Following the same invisible path as generations before them they stream across the Canadian border, through the South Okanagan, to Kamloops, over the Cariboo Plateau, past Williams Lake and Prince George. There they turn north west, towards the coast, out over Smithers, Hazelton and Stewart towards Alaska where the majority will nest. They spend at least 5 days traveling through B.C. Migrating cranes are a speedy lot. They can fly up to 80 k. an hour, more with a good tail wind, and cover 400-500 miles in a single day. No bird knows more about wind. They are good, safe pilots. If the weather is against them, they will settle down to wait it out. When flying they cleverly circle to get the best updrafts. Every maneuver is accompanied by long, lyrical calls. Even the strongest birds must rest. Fortunately for the cranes, B.C. 's grasslands and marshes offer critical stop-over points. Here, on the large ranches and Crown Land reserves, they can set down and relax, undisturbed, to gather strength for the next leg of migration. At such times food may be less essential to them than quiet spots to regroup and replenish energy. 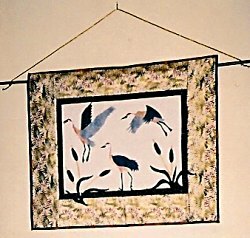 Birds of habit, the cranes use the same rest stops each migration. Landing points such as Chapperon Lake and Green Lake, regularly used both spring and fall, must be important to them, says Rick Howie. Disturbance and the stress of having to seek new rest sites, if any exist, might have a serious impact on their ability to finish the migration. "Thousands of sandhill cranes fly over B.C. every spring and fall" note naturalists Richard and Sydney Cannings, "but, because they prefer to nest in remote marshes and bogs, we simply don't know how many nest here. .. Although we have a general idea of their breeding range, we really don't know in detail where they nest either. All these questions are important ones. " What is known is that, as the great flocks sweep northward in spring, over the dry valleys of the Okanagan, dotted with their glacial remnant lakes, the meandering streams and how marshes of the Cariboo Plateau, and the deep valleys and moist shrub grasslands of the Peace River Parklands, all along the way pairs of migrating cranes leave the flights for their own private nests. Some of the thousands which use the Delkatla Wildlife Sanctuary on the Queen Charlotte Islands as a stopping point to Alaska, decide to stay, nesting in Naikoon Provincial Park. The majority proceed, to nest and breed in solitary locations in Alaska. In September they gather along the coast, to feed and plan the return journey. Not all leave at once. Again nutritional readiness, times of nesting and hatching, length of daylight, all seem to affect departure times. Young birds fly south with their parents and the family winters together. But, next spring the young will migrate on their own. One guided trip over the route is all they need. The autumn trip is shorter than that in spring because cranes aren't waiting for ice and snow to melt. In mid-September their bugling call warns of winter's approach. Sandhill crane voices signal the beginning and end of summer on the grasslands. On April 13, 2003, a friend and I counted 1,500 cranes flying over Kamloops Lake. In early evening that same day Rick Howie counted 750 sandhills resing in a field in the Nicola Valley south of here. There must have been others we both missed. But, 2,250 sandhill cranes were observed making one of the oldest natural pilgrimages in North America. Why, I asked Rick, are cranes important? He thought for a minute. "They're a sign that things are well in the world. Lots of cranes are an indicator that the big cycles are stable. Cranes are messengers from the North and South, an important reminder that we're just part of a connected system."